Home » Photographer captures amazing ‘light pillars’ phenomenon in North Bay, Ont. A northern Ontario man was surprised to wake up in the middle of the night to see beams of brightly coloured lights shooting up into the sky. “We can blame the two-year-old. He started crying at 1:30 a.m., so I got up and soothed him … and out the window I had the perfect view of these dancing lights in the sky,” said Timothy Joseph Elzinga. Not northern lights but light being refracted hundreds of feet in the air by ice tiny ice crystals formed by -18 degree weather. Light is projected from ground sources like traffic lights and business signs. 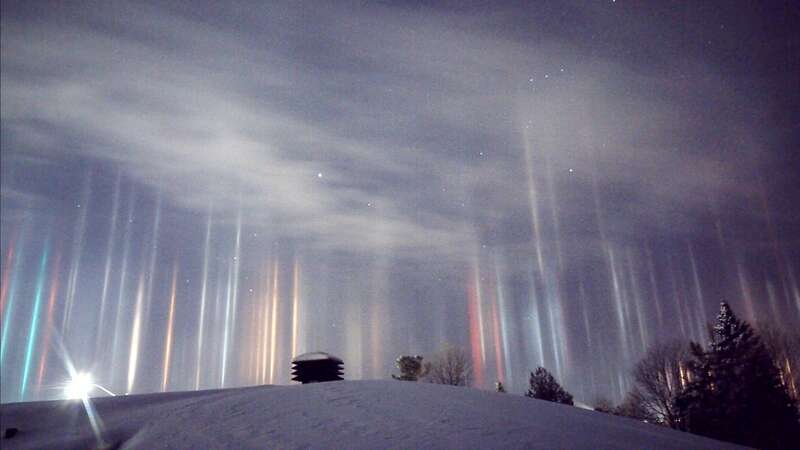 Light pillars appear when either natural or artificial light bounces off ice crystals floating close to the ground. In this case, the air was so cold that ice crystals were forming in the air, reflecting the city’s street and business lights. “It looked like someone from Star Trek was trying to beam people up,” Elzinga said.